In April, the Apocalypse occurred. He told me he and the kids were getting me a surprise. I was thinking something shiny and sparkly that costs lots of money. I only got the “costs lots of money” correct. We had discussed chickens. I had said no. I need to find a new word. 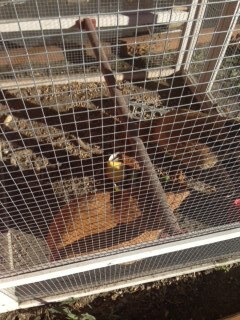 Chickens were purchased because they are supposed to give us eggs and you can give them food and water and leave them alone in the hutch. The chickens don’t like their hutch. It’s a nice hutch. It said it was for 5-7 chickens and there are only three. I don’t know how 5-7 were to live in it because with the 3, it seems crowded. And they like to get out. I think they purposely knock over their water and start making tons of noise so that they’ll get more. Then, when the door is open, they try to make a run for it. See them waiting at the door? I was supposed to have nothing to do with them. This worked great when it was summer and the kids were around all day. But now they’re in school and the chickens can be incredibly loud. I’m usually very good at keeping them in the cage when I feed them. I yell and kick and you’d think they’d hate me. But today, I wasn’t quick enough and they got out. Then they followed me around. I cut up a green tomato to get them back in the cage but that didn’t work. I threw in an oatmeal cookie and that didn’t work. I even tried some apple bread. So now we have annoying chickens that are probably developing cavities. This is a horrible picture but if you squint, you can see lemon bread. They’re cackling right now. It’s driving me nuts. Is it illegal to hire someone to kill chickens? Maybe leave the door open one night? Maybe they’ll ‘escape’. Also, raccoons are nature’s chicken exterminators. Dogs can be good at that, too. They like to play chicken-frisbee.